Wikipedia describes Richard Rohr as "one of the most popular spirituality authors and speakers in the world." 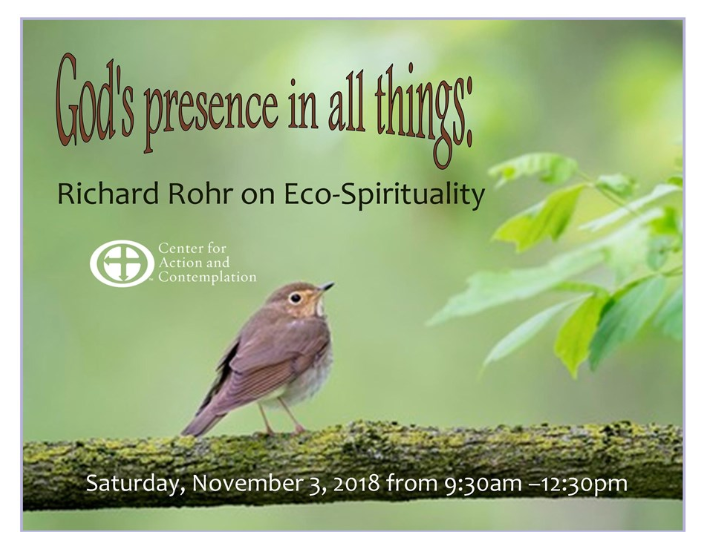 When Rolling Ridge Retreat and Conference Center hosted a simulcast of the 2018 Conspire Conference from the Center for Action and Contemplation (CAC), which is led by Rohr, the level of interest seemed to support that notion. Lawrence Jay, Rolling Ridge executive director, said within the first 24 hours, 23 people had registered for the event, which drew about 50 people; 30 on each of the three days (Aug. 31 to Sept. 2). Many others, Jay said, emailed to express their interest in more Richard Rohr events. Jay said the simulcast spawned a desire to meet regularly as a community to continue to process through Rohr’s teachings. Kris Girrell of Andover, MA, was at the simulcast and the first small group gathering. “I’ve been out to CAC a bunch of times, including being a graduate of a two-year program called the Living School,” he said. The first gathering of the “Rohr Action and Contemplation Small Group” took place on Oct. 7, 2018 – a day after the controversial confirmation of Supreme Court Justice Brett Kavanaugh. The group meets at 3 p.m. on the second Sunday of each month; sessions are about 90 minutes. Both Rohr events attracted a diverse group, Jay said. Despite their differing backgrounds, Jay says the group was processing similar feelings in the wake of the Kavanaugh vote. “There were a lot of people who had a lot of angst and a lot of concern about what to do,” he said. The group used Rohr's Oct. 7 daily meditation titled “Dying by Brightness," as the basis for their discussion. We read the mediation like a Lectio Divina – we read it, people shared about it, we read it again [three times], and people continued to build upon the conversation, Jay said. Jay said that while most in the group were dealing with grief around the confirmation, they also recognized that there are diverse views among those in their churches and ministry contexts. “It really became an opportunity for those in pastoral ministry to find some of the spiritual support they needed during at that time … and to talk through what this all means for them personally as well as in ministry,” he said. Jay spoke about what he hopes will grow from this first gathering. The simulcast and this small group are also the first steps in a potential partnership with the CAC. It’s possible that Rolling Ridge could become a “hub or satellite for their ministries,” Jay said. Beyond that, Girrell said he wants to be part of what he called Jay’s “powerful vision” for Rolling Ridge.